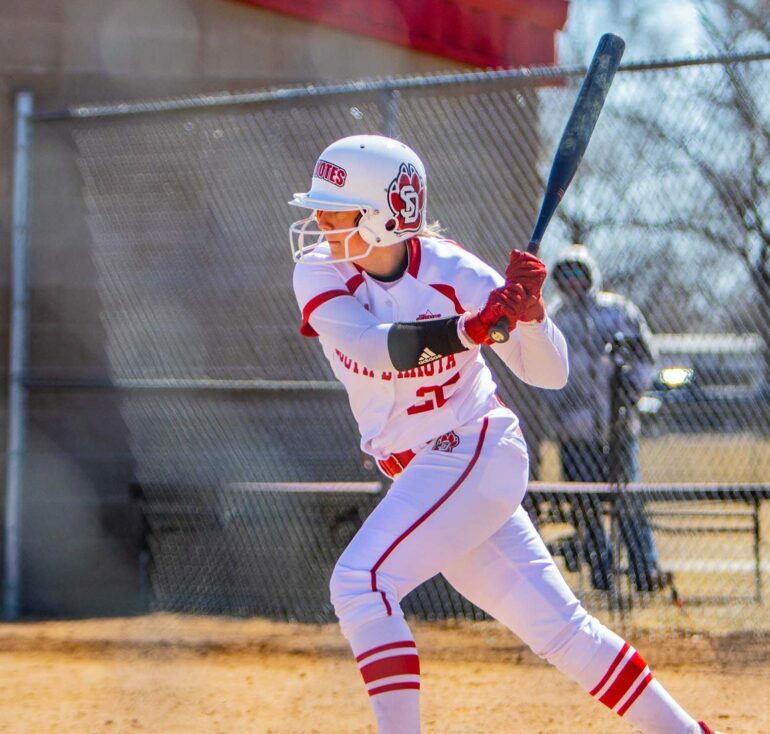 Coyote softball completed a three-game sweep against Omaha in Vermillion on April 6 and 7. The Coyotes bested the Mavericks 5-4 and 4-0 in the doubleheader Saturday and 9-1 on Sunday. Senior Dustie Durham led the way on Sunday, going 3-for-3 with a two-run homer. Fellow senior Alyssa Fernandez crossed home plate four times in the game. The Coyotes (25-8) now have a half-game lead over North Dakota for first place in Summit League play. Entering the top 10 for career Runs Batted In at USD is senior Jamie Holscher with 97. Three of those came this weekend, moving her total to 41 on the season. Holscher upped her batting average to .400 for the season, leading the Coyotes. Fernandez leads the Summit League with 34 runs after the series. On Sunday, she scored in the first, driving in two runs with a base hit and came around scoring in the second. She reached on an error and scored on a Durham base hit in the fourth, and walked and scored the winning run in the sixth. She was 4-for-5 during the series with three walks and a hit by pitch. Pitcher Alexis Devers only permitted one hit in the first four innings from the Mavericks Sunday. Her victory ties Durham for second place in the conference. The games marked the halfway point through Summit League play. USD hosts a three-game series with North Dakota next Saturday and Sunday: a doubleheader beginning at noon on Saturday and the third and final game at 11 a.m. on Sunday.